Despite the rainy weather forecast for the day, 105 people turned up for this walk. And they were amply rewarded, as there were only a few drops of rain at the start of the walk. Fortune favours the brave, as the saying goes. This walk was also the “maiden walk“ of our new walk leader, Jack Vella. The RAM committee hereby extends its thanks to Jack for his time. Unfortunately a lot of people only go as far as making comments and suggestions on how walks should, or should not, be conducted, but only a very few are willing to actually lead a walk or two. If any ramblers are willing to lead walks, you know what you have to do! From our meeting place near SPTT chapel, we walked down the hill (Telgha T’Alla u Ommu), then turned right towards Gharghur, passing just below Birguma and an active quarry until we hit the Victoria lines. After a short detour to view Ghar San Brincat and Ghar San Pietru, we continued to follow the Victoria lines until we reached Wied id-Dis. We walked up the valley bed for a short distance, then struck up the side of the valley to Gharghur. From Gharghur it was only a short distance back to our starting point. Below are some notes on the features seen during this walk, as contributed by Jack. Duration: 3 hours including the breaks. 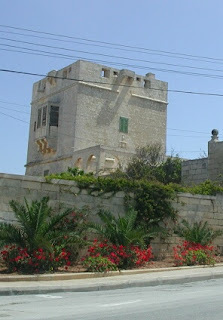 The Captain’s tower was built during the reign of Grand Master La Vallette and prior to the Great Siege of 1565. It was sometimes used by Grand Master La Vallette who used to stay here when he was touring the vicinities. It is named so because the Captain of the Militia (a group that guarded the area) was stationed in this tower. On the other side of the road one can also see a similar tower; Gauci’s tower, which was built round the same time. In the upper part of the tower one can notice several drop boxes that were used in case of any attacks, when boiling oil was dropped on the enemy. There are also several holes that were used by soldiers to shoot from. It is important to mention that the Naxxar Militia at the time had round about 100 soldiers making it only second to the capital city, Valletta. This pill box, formerly known as Defense Post R15, was built in the late 1930’s just before beginning of World War 2. 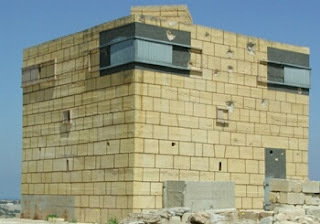 It is located in the upper part of T’ Alla w’ Ommu, and was built to enhance the safety of the area. In fact, before the time of Mount Maghtab, one could easily have a view of the whole area from Salina to Bahar ic- Caghaq. These type of pill boxes used to have two floors, the upper part for the guard and as target box while the lower part served as an accommodation for the soldiers. Il- Widna (acoustic mirror) can be considered as a primitive form of radar. It consists of a curved wall, in the form of a parabola, with a microphone or a person at the focal point. Sound waves, coming from the direction of Sicily would be concentrated at this focal point, providing a sort of amplification of faint sounds normally inaudible to the human ear. The idea was that enemy planes could be heard approaching from the north while they were still far enough to scramble fighters, warn civilians of an impending air raid, and also provide sufficient notice to man the anti-aircraft batteries. Its usefulness was in fact short-lived, as it was soon overtaken by the first radar. This consist of two caves, one of which is relatively small. In other times, when farmers and shepherds were common around the island, these caves were used as means of shelter from the weather. In the smallest cave we can see a frame of Our Saviour’s crucifixion. According to legend this was put up to protect the shepherds from bad spirits who used to haunt and taunt them, sometimes even ending in fatalities, with people being thrown into the valley below. Mass was sometimes said inside this cave during the month of November. The Victoria lines were built as a defense for the southern part of the island against a probable attack from the enemy if they land in the northern part such as Golden Bay, Xemxija or Ghadira bay. Even though Malta is a heavily- fortified island, the majority of the fortifications lie in the Cottonera and Valletta area. The main objective of the Victoria Lines that of offering security against attacks from the north, was never realised. However, they are still considered as part of our heritage. Unfortunately, although some parts have been renovated, many other parts are still in a bad state of repair. We have seen other sections of the Lines on past walks, and will certainly see more on future walks. The master antenna in Gharghur is the main telecommunication antenna on The Maltese Islands. The main TV stations as well as other telephony companies make direct use of this antenna. This antenna was built in 1960’s, and, forty years later, it Is still being used for the same purpose. 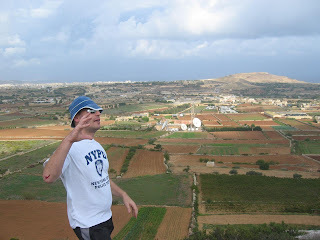 The antenna is the highest point in the Maltese Islands, as Gharghur is at about the same height as Dingli & Rabat, with only few metres difference. In fact the motto of the village is “Excelsior”, which means the highest. This valley is one of the most beautiful and extensive in Malta, with its trees and the renowned seven arched bridge. This bridge was not so long ago used for abseiling. It is also home to robins during their season. The current population of Gharghur is around 2700 people. Its history dates back to Roman times. Remains dating from Roman times were found in the main street, St. John Street, in 1955. In fact the olive crusher exhibited in the Domus Romana, was actually found in Gharghur. In 1436, with some 700 people living (200 families), the process started that would finally detach Gharghur from the neighbouring village of Naxxar. It was at this time that the first chapel dedicated to St. Bartholomew was built. Even so, it was not until 1598 that the village made its request to officially separate itself from Naxxar, finding harsh opposition from the parish priest of Naxxar, Fr. Julian Borg. And in fact it was not before 1610, following his death, that this request was finally accepted, with the villagers losing no more time to start building the present-day church, a project that took 28 years to finish. In 1734 some major alterations were made to the façade, lasting to the present day. Needless to say Gharghur is one of the most beautiful villages in Malta, having kept its identity throughout the centuries and, as far as I am concerned, the most important, as I was born here.